Houst on Hotel Market: Will 2017 be Up or Down? With Super Bowl 51 in the history books, Houston hotels are back to facing an uncertain future. The big question to answer in 2017 is, will this be a year of ups or downs for the local hotel market? 2016 was not a good year for the Houston hotel market as hotel occupancies declined 9.1%, ADR declined by 3.6%, and overall RevPAR declined by 12.4%. It was the worst performing among the top 25 hotel markets in 2016. Compared to Houston, the Dallas hotel market recorded a RevPAR increase of 5.7% in 2016. 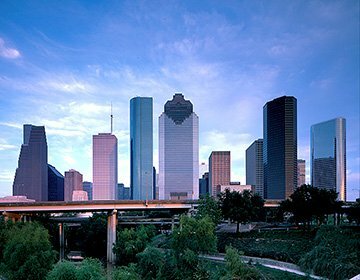 Despite Houston being such a diverse market, the recent downturn in the hotel market highlights the fact that the energy industry plays a significant role in the overall Houston economy. Optimism has crept back into the hotel market as the price of oil has slowly improved over the course of 2016. The West Texas Intermediate (WTI) crude oil price dropped to its lowest in February 2016, but has slowly recovered and is currently holding in the $50 to $55 per barrel range. Many in the Houston hotel industry are waiting for oil prices to go higher. As these prices rise, a consensus is building that the Houston economy may have seen its worst in 2016. In its January 2017 Short-Term Energy Outlook, the U.S. Energy Information Administration forecasts WTI to average $53.46 per barrel in 2017 and $56.18 per barrel in 2018, which is much lower than the $60 per barrel figure the oil industry has cited as the sweet spot to return to profitability. 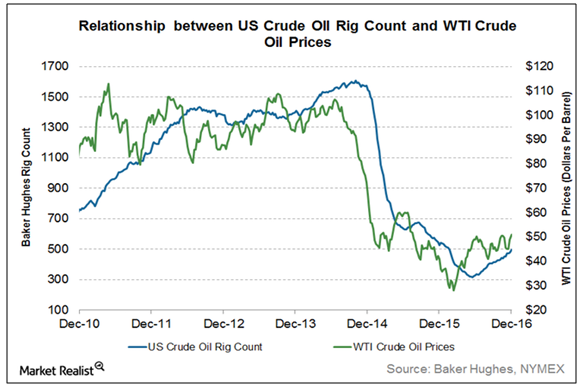 According to Baker Hughes, there were 741 rigs in operation in U.S. in February 2017, which is an increase of 200 from February 2016, but well below the peak of 1,931 reached in September 2014. This is arguably the worst downturn ever for the U.S. oil industry, but certainly not a serious downturn for Houston. Whether the industry will ever reach its peak again remains to be seen. Whereas the hotel market struggled in 2016, the opposite is true in the housing market. Houston set a record for home sales in 2016 with realtors closing on more than 91,000 townhomes, condos, houses, residential lots and high-rise units. This is remarkable considering the drop in oil prices and weak job growth, which continues to give developers pause. Houston building permits totaled $6.6 billion in 2016, down 19.6% from 2015. Residential permits declined 25.1%, while commercial building permits declined 16.7%. According to Dodge Data Analytics, Houston region developers began construction on $766.7 million worth of residential and non-residential projects in November 2016 compared to $1.27 billion in November 2015. Non-residential starts declined by 74.2% highlighting the reluctance of many developers to start new projects until the oil prices recover. According to initial reports by Texas Workforce Commission (TWC), metro Houston added 14,800 jobs in 2016 compared to 120,600 in 2014, before oil prices dropped. The job losses in energy sector were offset by gains in food service, health care, retail trade, and public education. However, the city’s job growth will be limited with these types of jobs. According to Colliers International, Houston office vacancy in fourth quarter 2016 stood at 17.5% an increase from 15.3% in fourth quarter 2015. Houston office market posted a negative net absorption of 363,539 square feet in 2016. The significant increases in vacancy rates in Houston’s office market have led to decreases in average asking rental rates. Even the Houston Airport System recorded a 1.2% decline in passengers in 2016, down to 54.5 million from 55.5 million the year before. The value of goods through the Houston/Galveston Customs District declined from $195.4 billion in 2015 to $162.8 billion in 2016. The vast majority of the decline is due to the decline in crude import volumes and declining oil prices. The American Chemistry Council estimates that over $170 billion in new U.S. industrial construction was driven by fracking and low-cost natural gas, most of it occurring on the Texas and Louisiana Gulf Coast, and over $50 billion of this construction was in east Houston and along the ship channel. This massive construction activity represents a temporary activity and helped alleviate further job losses during this downturn. 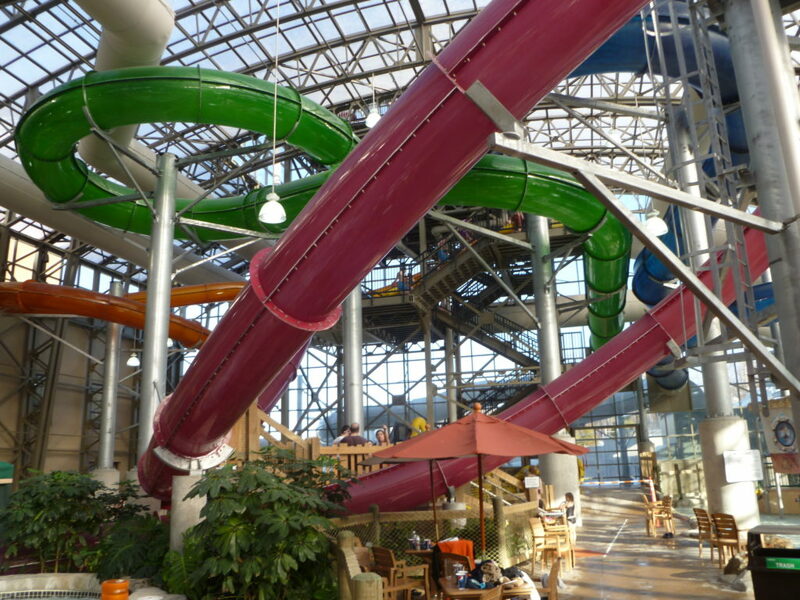 However, most of these large industrial developments are winding down. The previously booming oil market and the growing Houston economy fostered a fertile climate for new hotel development throughout the market. In the last 10 years, Houston added 232 hotels offering 23,201 hotel rooms with 10,046 rooms opening in the last three years alone. 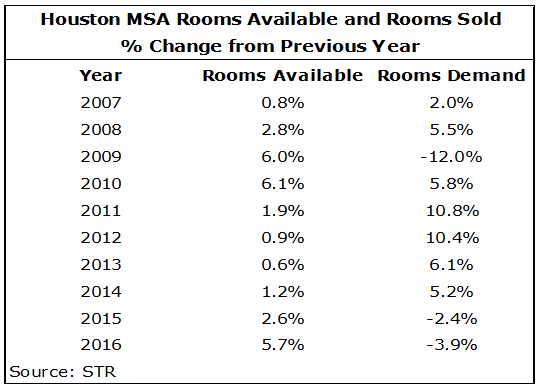 The following table illustrates changes in rooms available and rooms sold in Houston area. Houston saw a hotel boom between 2009 and 2010, right after the recession. Demand outpaced supply 2011 through 2014 that created another hotel construction boom in 2015 and 2016. With the ongoing downturn, we project fewer hotel projects to open in 2018 and 2019 as the market absorbs the new supply. 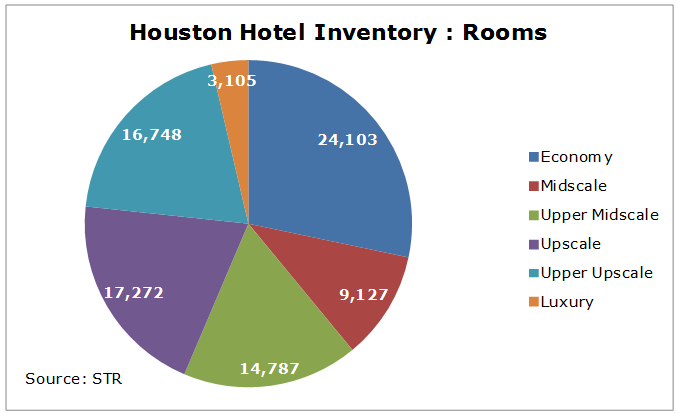 The following table highlights the current hotel and room inventory and hotel class as defined by STR. 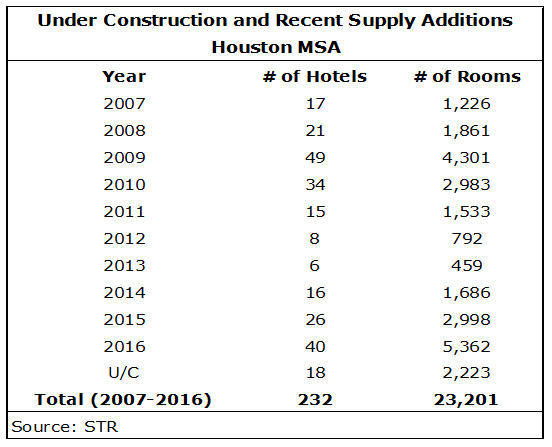 The following table illustrates historical occupancy and average daily rate (ADR) for the Houston MSA. 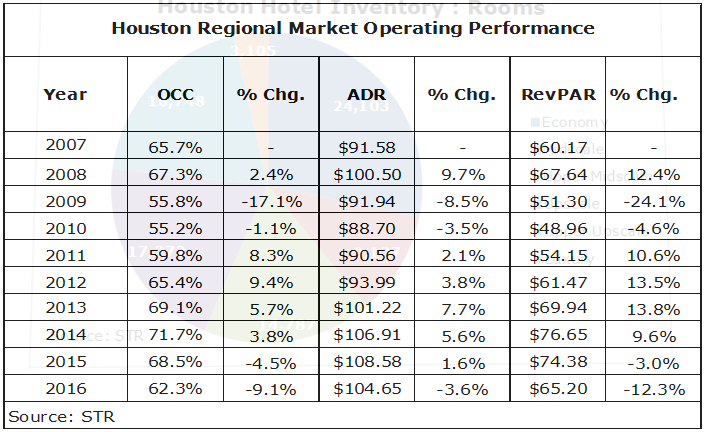 With the drop in global oil prices and new hotel supply in 2015 and 2016, the Houston lodging market suffered a big decline in occupancy and moderate decline in ADR in 2016. The presence of large companies and the growing energy sector helped the Houston lodging industry recover quickly from the recession in 2008. However, this time around the U.S. economy is robust and is helping the Houston economy through the energy downturn. Many Houston hoteliers hope that oil prices will increase and that drilling activity increases in 2017. However, it will take a very strong and quick recovery to bring back the 100,000 plus jobs lost between 2014 and 2016. All past drilling recoveries have been impeded by shortages of equipment and labor, and this recovery will be no exception. The magnitude of the recent downturn means this recovery has more ground to make up. Hotel owners and investors in the Houston market will need patience as the recovery slowly takes hold, and hotel demand improves. Houston is off to a promising start in 2017 due to the slowly increasing oil prices and the city hosting the Super Bowl. We project hotel demand to increase in 2017; however, with over 5,000 hotel rooms projected to open in 2017, the overall market will show slow growth and increasing rates will be challenge. The bright side is that we will not see such a strong supply increase again for some time. Despite the projected increase in demand in 2017, we project both hotel occupancy and ADR to remain flat in 2017. We project the hotel market will reach improved occupancy figures by 2020 as demand catches up with supply.